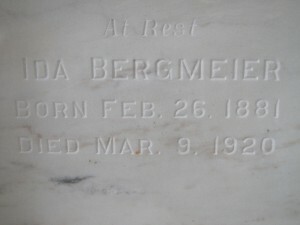 Miss Ida Bergmeier was born at Black Walnut, west of Crete, on Feb. 26, 1881. She was baptized and confirmed in the Lutheran Church at Crete. 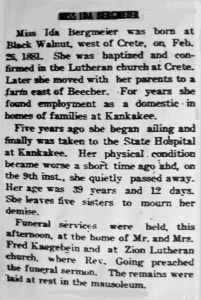 Later she moved with her parents to a farm east of Beecher. For years she found employment as a domestic in homes of families at Kankakee. Funeral services were held this afternoon at the home of Mr. and Mrs. Fred Kaegebein and at Zion Lutheran Church, where Rev. Going preached the funeral sermon. 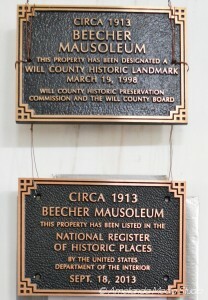 The remains were laid at rest in the mausoleum. 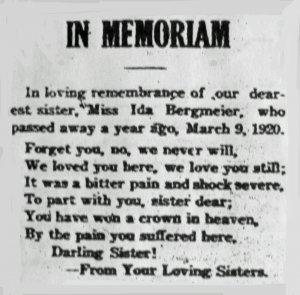 In loving remembrance of our dearest sister, Miss Ida Bergmeier, who passed away a year ago March 9, 1920. By the pain you suffered here. — From Your Loving Sisters. This entry was posted in Automated Burial Listing, Burial Listing, Burial Location, HEADSTONE, Obituaries- Have Full Copy, Zion Ev. Lutheran Church, Beecher by Sandra. Bookmark the permalink.